One of the friendliest bands we’ve ever met, The Wilderness Of Manitoba play gentle twinkling tunes laced with haunting harmonies… not entirely folk, not entirely pop (though one song reminded us of the wit and delivery of The Beautiful South), we heartily recommend fans of chilled strings and moonlit campfires to get along to one of their live shows – the two they played at the Reeperbahn Festival in Hamburg this year were rammed and won very hearty applause. 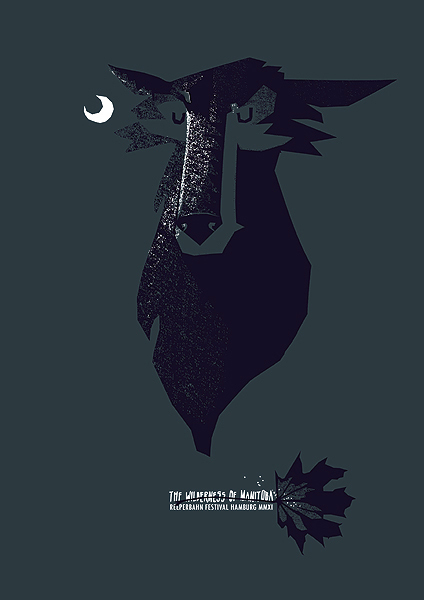 Here’s a print we did to commemorate their trip to Germany with a melancholy, or perhaps musing wolf whose howls we hoped might marry the band’s distant dreamy choral sound. Some of you may recognise him as Silver from the Red Riding Boots series we designed for the ‘Hungry Like A Wolf’ Guerrila Art Market show some time back here in Brighton. There are only a handful of these left, a bargain at just £15 each! This entry was posted in Festivals, Gigposters, Screenprints and tagged affordable art, animal print, bird print, dry the river, festival, flatstock, gig, gigposters, hamburg, magpie, petting zoo, poster, reeperbahn festival. Bookmark the permalink.